Most people consider summer the season to go boating, but for me fall has always been prime time, and the advantages are many. If you like to travel, you’ll find the rates at most resorts plummet as soon as the kids go back to school. And if you have kids, this might be a great time to have a short getaway with your spousal unit. For the best deals, check out Airbnb or VRBO, where you can actually see the number of days the owners have open. If the calendar is wide open, you stand a good chance of negotiating a lower-than-advertised rate by contacting the owner directly. Same goes for smaller resorts. While prices might spike during prime leaf-peeping season in places such as on the Hudson River and in New England, great waterways such as the Tennessee River and the Upper Mississippi get far less traffic and can be just as beautiful and more affordable. 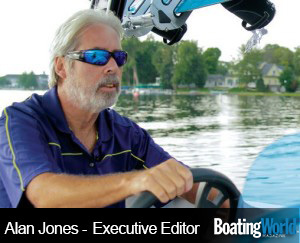 An added bonus is that fuel prices in fall are generally far lower than during prime boating months due to the drop in demand and the switchover to winter blends, which are less costly to produce. Another big factor is the weather. I live in Florida and my goal during summer boat outings is to stay in the shade. I will even troll in a direction that keeps me underneath the T-top rather than a direction that might provide more fish. During autumn, it’s always great to start the day when the water temperature is higher than the ambient temperature and steam comes off the water in the morning. And there’s no better feeling than the sudden glow of warmth I feel coming off plane after a crisp dawn cruise to a favorite fishing spot. Springtime gets most of the press praise for great fishing, but fall is a close second, and there’s far less angling pressure. Cooler water temperatures result in better fishing in shallower water, since it’s more comfortable for fish after a summer of sulking down deep during the dog days. For boaters who own cruisers not equipped with a generator and air conditioning, fall is easily the best time to overnight on the boat. The bugs are fewer and the temperature is usually ideal for sleeping. We do our annual testing in fall when the new boats are picked fresh off the factory floor and often still have residual fiberglass dust and smell of just-cured resin … aah, new-boat smell. Our three main test lakes — Lake Wawasee in northern Indiana, Table Rock Lake near Branson, Mo., and Lake Lanier, north of Atlanta — are all popular lakes during summer, but when we test during the week, we have them nearly to ourselves. away from it all is one of the best things about boating, and for that, fall rules.